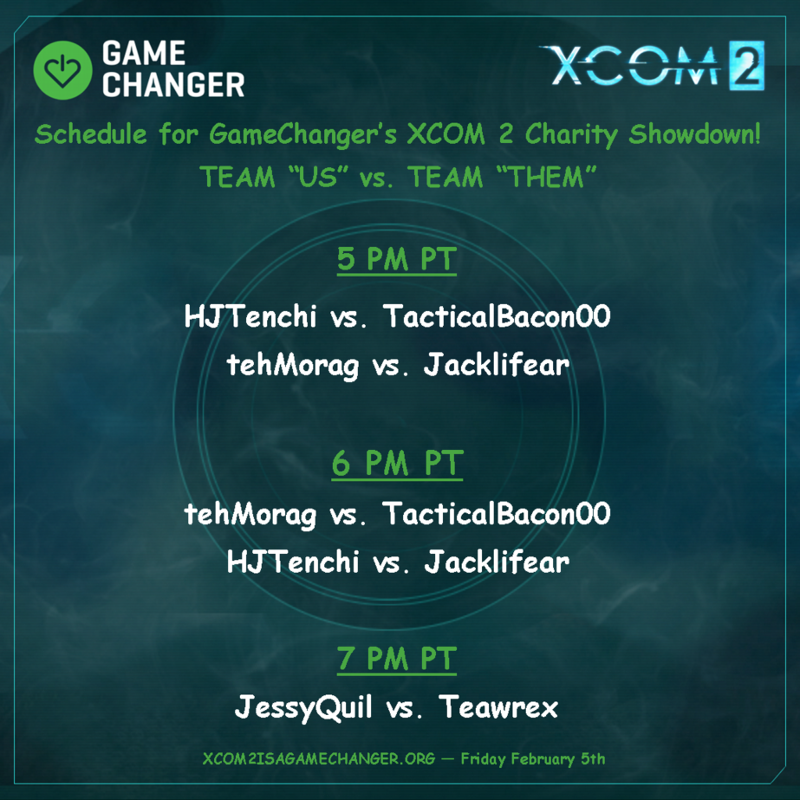 GameChanger's XCOM 2 Charity Showdown! Watch 6 of the top XCOM 2 streamers compete in a Team Showdown PVP, win giveaway prizes & raise funds for children with life-threatening illnesses! Overview: The Charity Showdown will feature 2 teams (3 streamers per team) competing in a PVP Show Match Style event. Each team will receive 1 point per win, and the team with the most points at the end of the event wins The Showdown! Members of the winning team will receive a free copy of the XCOM 2 Digital Deluxe Edition & more! Streamers & How To Watch: Live-streamed on Twitch - 6 Channels! Incentives, Prizes & Giveaway: Donate to win prizes, enter the giveaway & more! Ready to experience XCOM 2 like you've never seen it before? 6 of the BEST XCOM 2 players in the world are ready to THROW DOWN in a PVP team competition for charity! Team "Us" vs. Team "Them"! All 6 broadcasters will be streaming live on their Twitch channels & competing 1V1 starting at 5/6/7 PM PT on Fri 2/5. Review the Schedule for the Showdown, then visit their Twitch channels to watch the event! Click the links below to watch the stream & view the MultiTwitch for each PVP Battle! 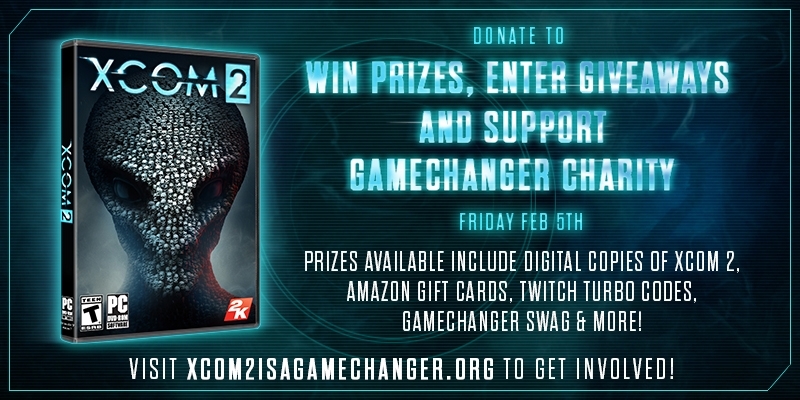 - Donate to GameChanger for a chance to win XCOM 2 Deluxe Edition & other prizes! - Enter into our social media contest for the XCOM 2 Prize Pack giveaway! 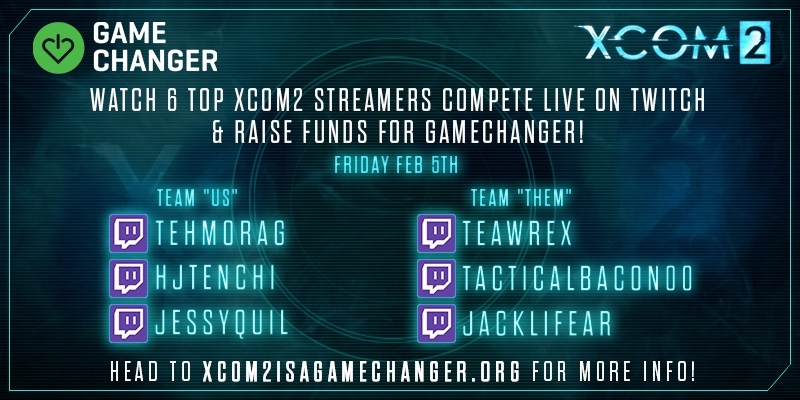 - Spread the word & tell your friends about the XCOM 2 event with GameChanger! - Donate $25 to receive 1 free month of Twitch Turbo (limited to first 50 donors)! - Donate $100 to receive a personalized Thank You Letter, GameChanger swag & more! Can't wait to find out if you're the lucky winner of the new XCOM 2? Follow the link to purchase XCOM 2 from Amazon, and a portion of the proceeds will benefit GameChanger! All donations will be processed by GameChanger, and support the charity's mission of improving the lives of children facing life-threatening illnesses through gaming. Watch the XCOM 2 video trailer to learn more about the new saga before the event on 2/5, and purchase a copy of XCOM 2 for yourself today! OFFICIAL TERMS & CONDITIONS FOR GAMECHANGER's XCOM 2 CHARITY SHOWDOWN - All donations will be processed & given to GameChanger Charity, a 501c3 registered nonprofit organization (IRS Tax ID: 26-3438815). REWARDS/PRIZES/PROMOTIONS: Donations are accepted from all countries. Digital incentives & prizes are available to all donors from any country. Some donor prizes/rewards may include a physicial item that must be delivered in the mail - any prize requiring postage is restricted & only available to donors in the United States. winners will be notified/sent their promotional prizes within 48 (end of campaign) unless otherwise noted. Any donation over $5 USD will be entered for a chance to digital copy of XCOM 2 Deluxe Edition ($74.99 value) (eligible to all international donors); Any donation over $10 USD will be entered for a chance to receive a $100 Amazon gift card (eligible to all international donors); Donate $15+ to receive a digital copy of XCOM: Enemy Unknown ($29.99 value); First 50 to donate $25 receive 1 free month of Twitch Turbo ($8.99 value); Donate $100 to receive a personalized Thank You Letter, GameChanger swag & more! Physical rewards to donors may take up to 4-6 weeks to be delivered in the mail. Any questions or concerns, please contact info@gamechangercharity.org or call 949-661-3000. Subject to Official Rules. NO PURCHASE OR CONTRIBUTION NECESSARY TO ENTER OR WIN. Void where prohibited or restricted by law. Sweepstakes is offered only in the (50) U.S. to legal residents of the U.S. who are currently physically residing in the U.S., and are 13 years of age or older at time of entry. Ends 11:59 p.m. PT on 2/7/16 unless noted otherwise. To enter without making a contribution, print out the Entry Form and follow the instructions. Mail-in requests must be postmarked no later than 2/5/16, and received no later than 6:00 pm PT on 2/7/16. Winners will be notified by 2/14/16. If donors wish to contribute but do not wish to be entered, they can type out a donation comment to remove themselves from the entry. Limit (5) entries total, per person, regardless of overall Contribution amount (if applicable), or method of entry. Odds of winning depend on the number of eligible entries received. Subject to Official Rules.